From the ethicist the New Yorker calls "the most influential living philosopher," a new way of thinking about living ethically Peter Singer's books and ideas have been disturbing our complacency ever since the appearance of Animal Liberation. Now he directs our attention to a new movement in which his own ideas have played a crucial role: effective altruism. Effective altruism is built upon the simple but profound idea that living a fully ethical life involves doing the "most good you can do." Such a life requires an unsentimental view of charitable giving: to be a worthy recipient of our support, an organization must be able to demonstrate that it will do more good with our money or our time than other options open to us. Singer introduces us to an array of remarkable people who are restructuring their lives in accordance with these ideas, and shows how living altruistically often leads to greater personal fulfillment than living for oneself. 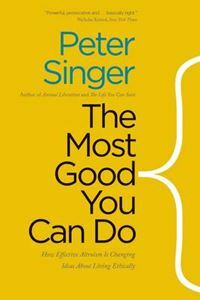 The Most Good You Can Do develops the challenges Singer has made, in the New York Times and Washington Post, to those who donate to the arts, and to charities focused on helping our fellow citizens, rather than those for whom we can do the most good. Effective altruists are extending our knowledge of the possibilities of living less selfishly, and of allowing reason, rather than emotion, to determine how we live. The Most Good You Can Do offers new hope for our ability to tackle the world's most pressing problems.